Poplar (Populus adenopoda Maxim.) and radiata pine (Pinus radiata Don.) wood were treated with an aqueous solution containing styrene-acrylic copolymer (SAC) and sodium silicate (SS). The effects of this treatment on the thermal stability and combustion behavior of the wood were determined. Thermogravimetric (TG) analysis showed that treatment in the presence of SS resulted in earlier thermal degradation compared to samples untreated and treated with SAC alone. Cone calorimetry showed that treatment of wood with SAC alone resulted in increased total heat release, total smoke production, and CO and CO2 concentration. Wood treated with SAC/SS was more difficult to ignite as evidenced by longer ignition time and higher limiting oxygen index; however, the treatment did not reduce the production of smoke and carbon oxide. Scanning electron microscopy and energy dispersive X-ray analysis of residual char indicated that SS was mainly deposited in the lumina of vessel or tracheid, and SS distribution in wood was not uniform. 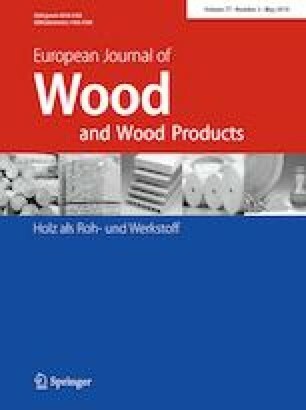 These findings demonstrate that incorporation of SS retards the flame of SAC-treated wood; however, the fire risk is not reduced due to dense smoke and CO production. This work was supported by the National Key Research and Development Program of China (2017YFD0600203), the National Natural Science Foundation of China (31470585 & 31500469), and the Natural Science Foundation of Heilongjiang Province, China (JC2015006).